A genuine, buttery, hand-laminated croissant is an increasingly rare pleasure, but not one beyond the enthusiastic home baker. August Zang’s Viennese bakery brought the crescent-shaped Austrian kipferl to Paris in the late 1830s, and while this is generally accepted as the ancestor of the croissant, the first written recipe to create this butter-laminated dough apparently dates to just the early 20th century. Mix all the dough ingredients together very thoroughly (if you have a powerful stand mixer with a dough hook, start on slow, then speed up a little), until the dough is utterly smooth. Shape the dough into a 25x12.5cm/10x5in rectangle on a floured work surface, then wrap it in clingfilm/plastic wrap. Roll the butter into a 12.5x12.5cm/5x5in square between two sheets of clingfilm/plastic wrap and refrigerate both the dough and the butter overnight. Take the butter out of the refrigerator 1 hour before the dough, so it becomes pliable. Place the dough on a lightly-floured surface, then put the butter in the centre, sides lined up. Fold the uncovered dough at each end over the butter, so the edges meet but do not overlap. Give the dough a quarter turn, then roll it out from the middle away and towards you, to seal the dough and butter together. When you have an elongated rectangle 5–7mm/¼in thick, fold the third furthest from you in to cover the middle portion, then the third nearest to you over that, to form an even, layered parcel. Cover the dough and chill it in the refrigerator for 15 minutes. Repeat the quarter turn, roll, fold and chill twice more, ending with 1 hour in the refrigerator. Roll the dough out to a rectangle measuring 45x20cm/18x8in and about 3mm/1/8in thick. Slicing across the width of the rectangle, cut the dough into 12 elongated triangles, 7.5cm/3in at the base and 20cm/8in long. Cut a small nick in the middle of each base, then roll each croissant up from the base of the triangle towards the tip. Place the croissants on baking sheets lined with non-stick baking parchment and brush with beaten egg. Prove for about 1¼ hours, ideally at around 28°C/82–83°F, or until well risen. Heat the oven to 190°C/170°C fan/375°F/gas 5. 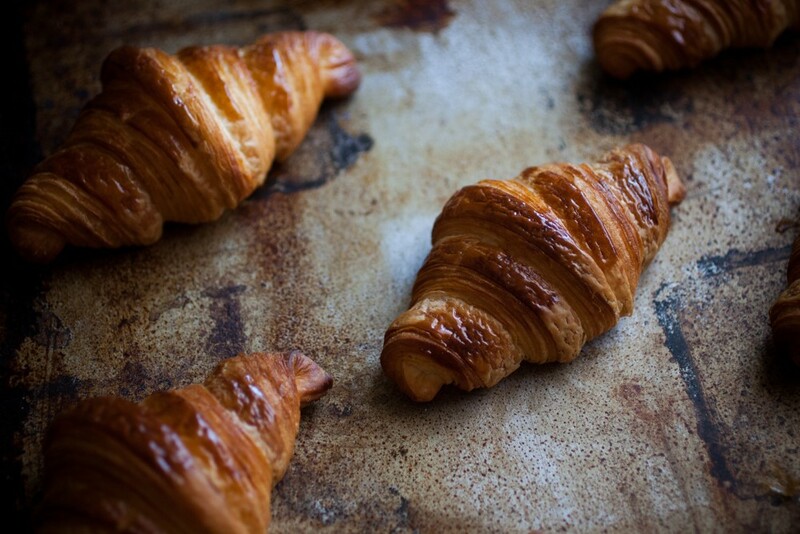 Brush the croissants with egg again and bake for 15–20 minutes, or until golden brown. Transfer to a wire rack to cool. Mickael Jahan has been baking for over 25 years, starting in his home village of Vendee, France, when he was under 14 years old. In 1998 he landed in London and within three days found work at Sally Clarke’s Bakery, one of the UK pioneers of the current Real Bread movement. Since graduating from the Institute National De La Boulangerie Pâtisserie, he has worked in every type of bakery of every size in both the UK and France. Taken from Slow Dough: Real Bread by Chris Young, published by Nourish Books. Hardback, £20. Commissioned photography Victoria Harley.